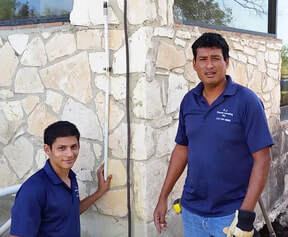 We are a professional San Antonio based House Leveling and Foundation Repair Company. ​ CJ House Leveling Inc. offers limited financing, Engineer certified methods and Engineer Certifications for each job as well as City of San Antonio permits. City of San Antonio license number is: LIC #H919902. My name is Jesus Cuellar. I started my company CJ House Leveling in 1991. I was 21 years old at the time. I remember going before the Board of the City of San Antonio Licensing Department and being asked questions about foundation repair and being issued my license. I recall at the age of 8 years old spending my summers helping my father leveling houses. I grew up in the foundation repair industry and quickly learned my way around foundations. I familiarized myself with leveling instruments, drew up foundation diagrams and plans, inspected houses, dug holes. Throughout my teenage years I learned valuable information about how to properly level homes as well as the causes of foundation problems. Our Company has endured for nearly 25 years. CJ House Leveling Inc. has grown as a company doing work in and around the San Antonio area. CJ House Leveling Inc. is a family owned business that prides itself in doing good work. My Son Daniel Cuellar is also Learning the business and is following the same steps I did growing up. I recall the different leveling systems used 25 years ago and how techniques, systems, and technologies have adapted or changed helping us provide our clients with an experienced streamlined approach to leveling foundations. It is our sincere intention to provide the best possible personalized service to our clients. Our inspections are thorough because we want our clients to know that we do care about their homes. The more time you take inspecting and studying the foundation reflects the sincere concern and desire to provide the best service. CJ House Leveling Inc. has repaired countless pier and beam foundations. From homes in the Historic districts as well as homes in the King William area. Including slabs in Terrell Hills, Alamo heights. CJ House Leveling Inc. is a very capable company and can provide you with foundation repairs that can withstand the test of time, and preventive measures that will preserve the work to your home for many years to come. CJ House Leveling has been around for nearly 25 years and will be around for many more years. The Legacy of our Company is founded on a Solid Rock. The initials stand for a deep heartfelt belief in doing honest good work and that would only be possible through my Lord “CJ” Christ Jesus. We love new projects! Let's get started.